What do morning look like in your house? If you were to ask me this, I could answer it in one word...crazy. :-) One of the things that I have come to realize since having children is that you can't really plan or go by a schedule. Yes, you can have a schedule or plan of action in place, but kids like to throw you curve balls, and this usually disrupts your plans. Take for instance tonight. Usually our girls are in bed by 9PM, after fighting with them for 2 hours to go to bed and stay in bed. We can expect them to get up at least once in the night asking for milk, water, diaper change or belly rub. And, then they will wake in the early AM around 6:30-7AM revving to go, with so much energy, you feel jealous as you don't have that spark anymore, even after a cat nap (if you can get one in). But, because they went to bed at 7AM, we are expecting and early early AM tomorrow, say around 5AM. While is has been nice to have a few extra hours of quiet time, which we used to relax on the couch and take in some of the Oscars before starting to work, my husband and I both know we will pay tomorrow when we wake up at the crack of dawn. Even the strongest of coffee will not wake us to the point that we will feel fully functioning. And, our day will be long and drawn out. Ugg. 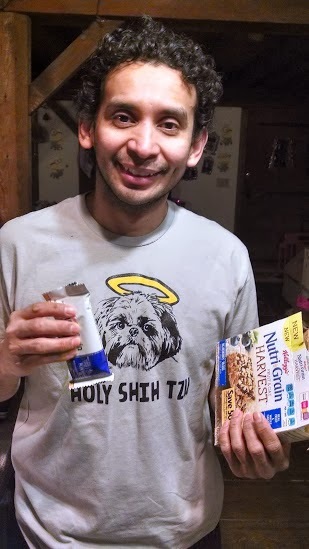 But, one thing is for sure, we will be ready to tackle the early AM, with delicious on-the-go snack Nutri-Grain®Fruit & Oat Harvest Cereal Bars, which I was recently sent to review. You would think that with my husband home on the weekends that our weekends would be more structured and we would find time to have a real breakfast at the table, instead of standing in the kitchen sipping our coffees and snacking on fruit or a quick bite to eat. But, depending on what time the girls go to bed the day before and if we have classes or activities we have to run off to, breakfast (the most important meal of the day) is often overlooked. While I try to have quick microwave oatmeal cups, fruit cups and other on-the go snacks on hand, when we wake with glassy eyes in the AM, the last thing we want to do is have to prep something to eat, or sit to enjoy. Instead, we prefer cereal bars like Nutri-Grain® Fruit & Oat Harvest Cereal Bars as they are easy to grab and enjoy on the go. Whether my husband is eating one on the way to the car, and then another while stuck in traffic, he finds he has more energy once he reaches the office after snacking on a delicious tasting cereal bar. And, for me, I love the convenience of being able to stash a few in my diaper bag, glove box, or jacket pocket, when hunger strikes or I realize that I forget to eat something for breakfast, I can pull out a cereal bar and refuel. With so many cereal and snack bars on the market, it is hard to choose one. Right? 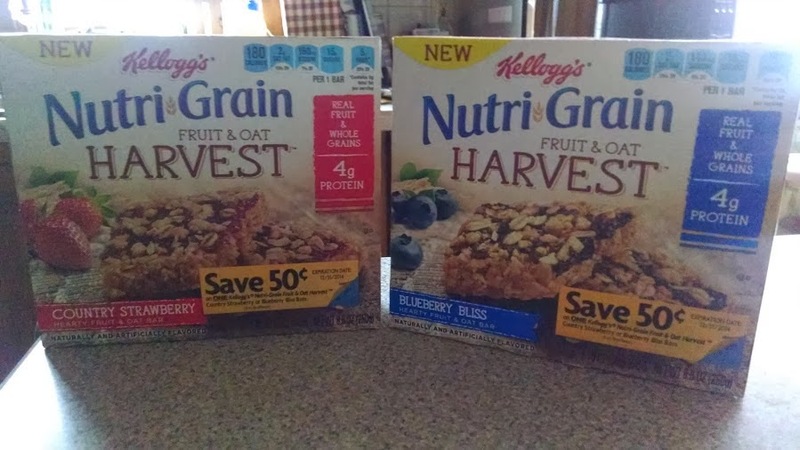 Well, after spending this past weekend sampling the CountryStrawberry and Blueberry Bliss flavors of Nutri-Grain® Fruit & Oat Harvest Cereal Bars, I can now say that when I go food shopping, I will be restocking on more Nutri-Grain® Fruit & Oat Harvest Cereal Bars. Why? Besides the convenience of these on-the-go bars, which you can put in your pocket, leave in a bowl on the counter to grab and go, etc., the taste is amazing. I have sampled my fair share of cereal bars, but none have been full of flavor like Nutri-Grain's Fruit & Oat Harvest Cereal Bars. The taste is simply amazing. These cereal bars contain 4 grams of protein and a hearty combination of real fruit and whole grains to help you not only survive but thrive all morning. Just looking at the Nutri-Grain's Fruit & Oat Harvest Cereal Bars, you can see that is packed with real fruit and oats, and not just a ground substance that is formed into a bar, oftentimes leaving you wondering what you are eating. I could see the actual strawberries and blueberries that make up these wholesome cereal bars. While my husband was a fan of the Blueberry Bliss cereal bars, I have to say that my favorite was the Country Strawberry ones. And, while I usually need a strong cup of coffee in the AM, I found myself pouring a tall glass of cold milk to wash down this delicious tasting cereal bar. The milk really hit the spot. :-) And, when it came time to take Savannah to her 8:45 AM gymnastics class on Saturday, I was prepared – well not really as awake as I would have liked, but breakfast was covered as I had two Nutri-Grain Fruit & Oat Harvest Cereal Bars in hand – one for the car ride to the gym and one to enjoy while waiting for Savannah’s class to finish. A mom sitting next to me couldn’t help but comment on the cereal bar and asked what I was eating, as it looked tasty. I couldn’t help but break off a piece to let her try. And, as she chewed her first bite, she agreed that this cereal bar was flavorful and unlike others she had tried previously. She couldn’t get over how thick the bar was, and that it wasn’t chewy or lacking flavor, like others. With the small piece that I gave her to try, she kept getting pieces of sweet strawberry, which she loved. She told me that after the gymnastics class, she was heading to the market to buy a couple boxes, as she struggles in the AM’s with little ones, and oftentimes skips breakfasts and finds herself dragging all AM, or worse…reaching for unhealthy snacks to fill up on, adding unnecessary weight to her waistline. To learn more about the new Nutri-Grain® Fruit & Oat Harvest Cereal Bars, visit the Nutri-Grain Facebook page: https://www.facebook.com/NutriGrain. 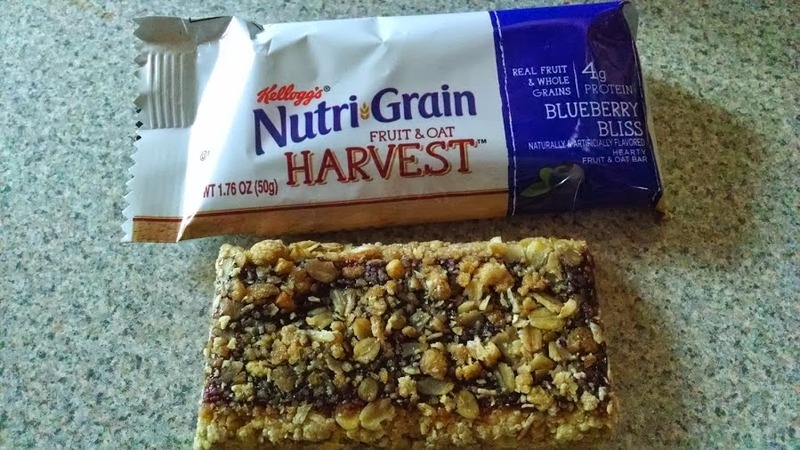 You will find both the Country Strawberry and Blueberry Bliss flavored Nutri-Grain® Fruit & Oat Harvest Cereal Bars in the snack aisle of your favorite local grocery store. I've never tried these Harvest bars before but they sure look delicious! I'd love the Strawberry flavor the best! Blueberry bliss sounds good. I haven't tried these but I should check them out.